"A simplified and stripped down version of Cubase"
The product presented here is called SEQUEL 3. It’s an all-in-one music production studio from the renowned Steinberg company, a leader in the field of dedicated audio software. Now, with SEQUEL 3 you’ll get a simplified and stripped down version of Cubase, the latter being one of the top professional DAWs, with DAW standing for Digital Audio Workstation. Note that elsewhere on Winportal Cubase is presented separately. 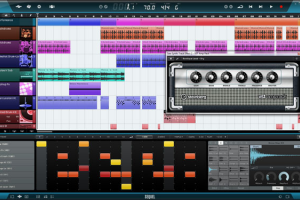 So, here you have a feature-rich application encompassing everything you might need to start recording your music, including some advanced editing tools one might not expect in an entry-level workstation. If you’re entering the audio recording field and would like something a bit more adequate to start with instead of the famous Cubase, consider proceeding to this Steinberg download.